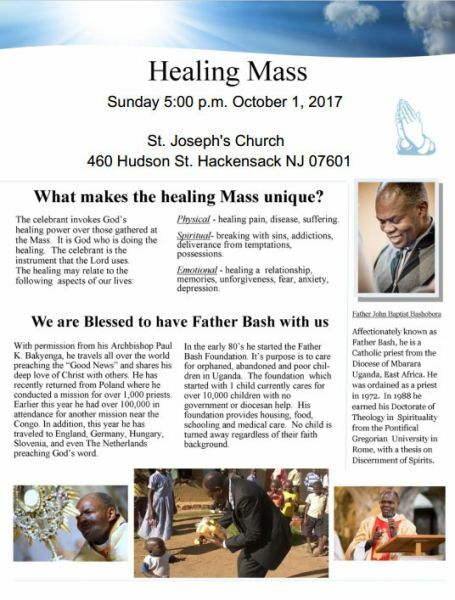 We welcome all for a healing mass on Sunday October 1, at 5:00 pm with Fr. John Bashobora. Father John Baptist Bashobora is a charismatic priest known for his prayer, healing and deliverance ministry. Fr. Bash travels all over the world preaching the Good News, sharing his deep love for Christ with others and praying in the healing power of The Holy Spirit for healing the sick and delivering people oppressed by bad spirits. Our Lord has chosen this humble priest to manifest his great power, as many experience conversions, ?healing, and deliverance after prayer meetings with Father Bash.